Raritan C.P. 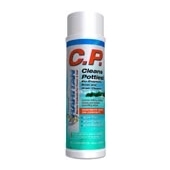 is the best product that you can use to clean your marine toilet and Boatersland has 22-ounce cans of C.P. available now at a very low price. C.P., as the name implies, cleans potties and is the only toilet bowl cleaner that Raritan recommends for its line of toilets. C.P. eliminates the worst raw odors from the toilet’s intake lines without brushing and is the first bowl cleaner to combine 100 percent biodegradable cleaning agents with a specialized strain of bacteria for thorough cleaning. If you need cleaning agents or repair parts for your marine toilet, Boatersland is the best site to find these products.